​20,000 GRS Airdrop to Celebrate Groestlcoin(GRS)’s Listing on DigiFinex ! DigiFinex is going to list Groestlcoin(GRS) and open its deposit service on 20th Mar, 2019 16:00 (GMT+8). Withdrawal and trade service will be open on 21st Mar, 2019 16:00 (GMT+8). Groestlcoin (GRS), launched on 22nd of March 2014 with a focus on technological advancement, Groestlcoin is a fast and secure coin with almost ZERO fees, that is privacy oriented. Major development release every 3 months. Groestlcoin was the first coin that activated SEGWIT and is Lightning Network ready. The cryptocurrency operates as open source software on a peer-to-peer model (transactions take place directly between the payer and payee). This means that no trusted intermediary such a bank or PayPal is required to verify the details of the sender and receiver. Rather, the transactions are verified by nodes (the network of computers/users spread globally) and recorded in an open ledger referred as blockchain. 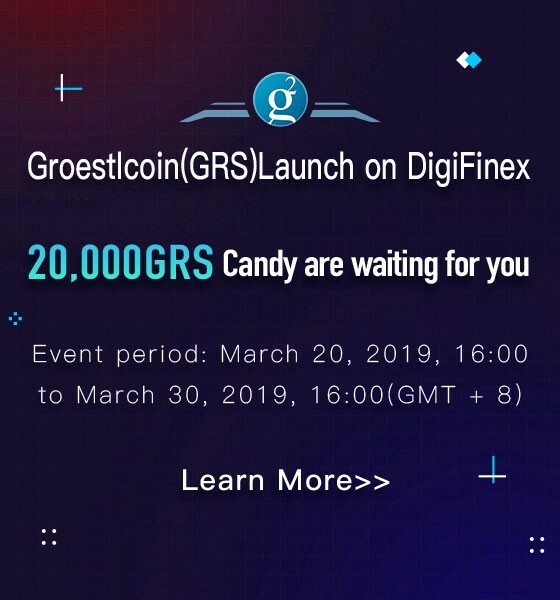 To celebrate GRS listing, we will be airdropping 20,000 GRS candies! Rewards will be given out within 5 business days after this event ends. DigiFinex will put 6,000 GRS in the candy box, first come first served. Minimum lock-in is 100 GRS. The lock-up period is 5- 10 days. Each person can receive up to 300 GRS. For example, The user locks 1,000 GRS in the candy box and locks for 10 days. The user will receive a reward of 30 GRS immediately. 2. Ranking for GRS trades. During this event, the rank depends on the user’s GRS trading volume. 3. Each time a user invites a new party who registers with KYC, both parties will receive a reward of 0.02 ETH + ￥300 coupon. One Stop Digital Financial Service Platform.